Support Center > Knowledge base> Article: Why is my credit card being declined? These are the most common reasons a card will be declined for payment. If you have additional questions or need additional assistance you can contact customer service at 877-922-2547 Mon-Fri 9am-5pm. For assistance with details about your card such as the billing address or card code you will need to contact the entity that issued you the card. In order for your payment transaction to be approved the address you enter for the credit card billing address must match the address the card issuer has on file for you. This is your own address, where you would receive your credit card billing statements and any other correspondence from the card issuer. This is NOT the address where you would mail your payment. This is also NOT the credit card company’s address. Remember, this is a security feature to keep others who may have your card from making payments online. In order for your payment transaction to be approved the card code you enter must match what is on the card. This is a 3 digit code found on the back of the card, or a 4 digit code on the front of the card for American Express. Sometimes it can be hard to read the code on older or worn out cards. 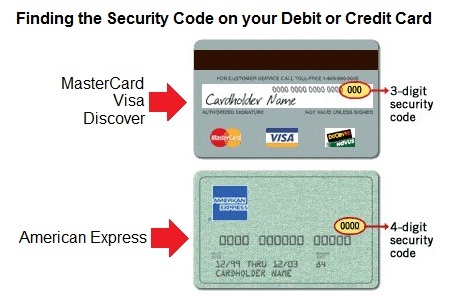 If you cannot read the code you must contact the card issuer for assistance. The expiration date entered must match what is on the card. Please confirm you entered the correct date. If you do not see a message about a card code mistmatch, AVS mismatch or invalid expiration date, this means the card issuer is declining the transaction for another reason. You will need to contact the card issuer for more information or use a different card for your payment.